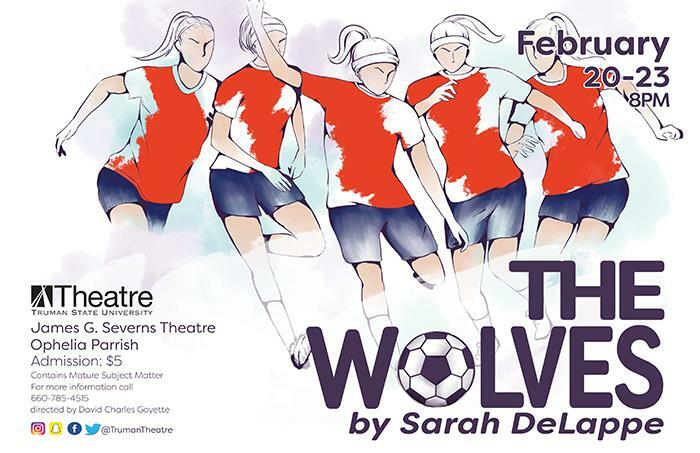 “The Wolves” is a contemporary drama about a girl’s indoor soccer team as they warm up before their weekly games. From the safety of their suburban stretch circle, the team navigates big questions and wages tiny battles with all the vim and vigor of a pack of adolescent warriors. “The Wolves” is a portrayal of life, liberty and the pursuit of happiness for nine American girls who just want to score some goals. This show contains adult content and is not recommended for anyone under the age of 14. Tickets are $5 and can be purchased at the Ophelia Parris Box Office from 11:30 a.m.-5:30 p.m. Guests from out-of-town may reserve tickets by calling 660.785.4515. For more information, contact David Goyette or visit the Theatre Department's webpage.